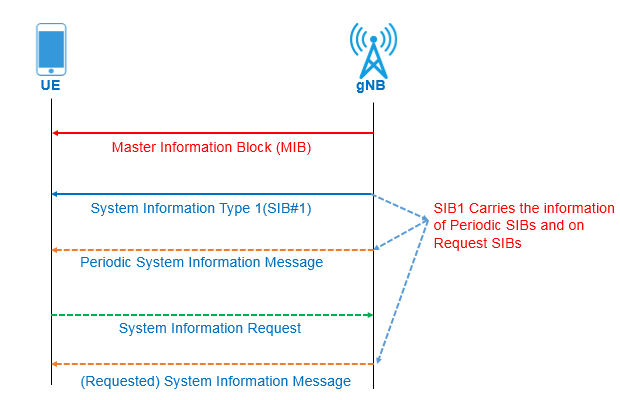 Over all structure of MIB and SIB in NR is almost similar to LTE and other legacy technologies. However there is a major difference related to the periodical transmission of SIBs. In LTE and other legacy technologies the SIBs are broadcasted priodically regardless of whether UE wants it or not. But, in New Radio (NR) there are two versions of SIBs. One is being transmitted periodically like LTE and other is being transmitted only on-Demand i.e. when requested by UE. It is transmitted on OFDM symbol 1,2,3 . It uses 0 to 239 sub carrier number on symbol 1 & 3, where as on symbol 2 it uses subcarried number 0 to 47 and 192 to 239 as per TS 38.211.
systemFrameNumber : Similar to LTE, NR does have a 10 bit System Frame Number start from 0 to 1023. MIB carries 6 most significant bit (MSB) of the 10 bits and remaining 4 LSB of the SFN are conveyed in the PBCH transport block as part of channel coding (i.e. outside the MIB encoding). pdcchConfigSIB1: It is corresponds to RMSI-PDCCH-Config in TS 38.213 , section 4.1. Determines a bandwidth for PDCCH/SIB, a common ControlResourceSet (CORESET) a common search space and necessary PDCCH parameters. 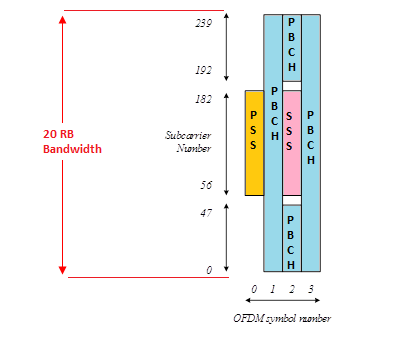 If the field ssb-SubcarrierOffset indicates that SIB1 is not present, the field pdcch-ConfigSIB1 indicate the frequency positions where the UE may find SS/PBCH block with SIB1 or the frequency range where the network does not provide SS/PBCH block with SIB1 (see TS 38.213 , section 13). MIB / SIB acquisition process vary case to case. Here we will dicsuss overall MIB/SIB acquisition process as defined in TS 38.331 NR-RRC specification. 4 symbols of first subframe second slot symbol 0, 1, 2 and 3.